Simple and effective to-do list and task manager that helps you make schedules, manage time, and organize all aspects of life. Cons: The app has never failed me although sometimes I feel a bit insecure about getting notified. In the end, I always get the right notifications. Also, when I accidentally complete or dismiss a notification on my Android phone it's difficult to seek and find the task in order to reset it back to "active". It's really affordable to buy the premium plan. The premium plan gets you a calendar for the web version, which by the way you get access to on your phone even if you're on the free version. Thank you ticktick for that BUT I've repeatedly paid for a premium plan because I think you guys are totally worth it. Again really good minimalist interface and great readability. I like the fact that I look at my tasks and I instantly know what I need to do, with no distractions. I use Asana for bigger projects and it can get confusing. With ticktick, it's impossible to get confused or miss a task. I can simply forward an email to the ticktick email address, add day and time in the subject line and be reminded of the task. How cool is that! I've tried nearly all task management apps out of curiosity and because my clients use different apps. Ticktick is the best task management app if you want a simple task list and reminder for what you need to do. No bells and whistles, no big project management features, and thank god for that. A simple to-do list with all of the features you need. Pros: I love it's clean interface, it is really easy to see and to use. 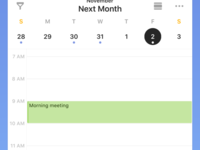 One of the features I use the most is smart date parsing, it is so easy to add tasks and due dates and repeating options this way, also, paired with Voice input mode, it is really powerful and easy to add tasks on the go. It's recent addition of pomodoro timer to the task is such a cool little feature I'm still getting used to, but it has been really helpful. 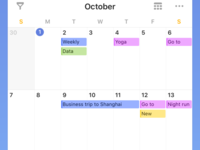 Calendar integration and views are perfect for a weekly review and to see the big picture and your month/week at a glance. It has been my preferred task manager for quite a while now and will continue to be. Cons: The only downside I have found is that in its iOS, the reminder notifications can get lost if you don't get to them on the spot, they disappear to the "Today earlier" part of notification center and they don't keep persistent in your first glance of the notifications. Other than that, I believe it is the most functional and powerful multi platform task manager around. Overall: Better track of work, personal and home tasks. Freeing up my mind and being able to keep almost every aspect of my day to day life organized. Cons: - Limitation of tasks and items in free version, but it is enough to manage if you put effort. Pros: My favorite feature of TickTick, and the one that makes it stand out, is the way it handles recurring to-dos. I wanted a calendar-based to-do list where I could add monthly items like paying certain bills, recycling pick-up, etc., and TickTick was the only app I could find that allowed that. At least for free. TickTick lets me keep track of everything, big and small, without having to remember to put things on the to-do list over and over again. Plus, you get the satisfaction of actually checking things off as if they were on a paper to-do list. Cons: There are sometimes minor glitches, such as with dragging the order of items each day. But it's nothing so big that has turned me off from TickTick yet. 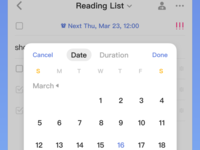 Overall: I use TickTick as my personal to-do list, keeping track of everything from when to pay bills to events on my calendar to random chores. Cons: - There's an iffy privacy and security policy, and the company is based in China. This feels very uncomfortable if you want to trust an application with private information. Overall: TickTick is a very, very capable task manager with outstanding apps on all platforms. It's quick, syncs perfectly, and is very feature-rich. However, the Chinese ties and accompanying privacy and security policies may be a turnoff. Hey there! Thanks a lot for the support. Glad you've enjoyed TickTick. 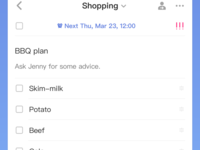 Pros: Great functionality, you can build smart lists, the calendar view is great, the UI on the mobile app is getting better and better, you can assign tasks, create subtasks, and upload photos. Cons: The only thing missing is a native time tracking feature within Ticktick. You can integrate with at least one app, but you have to log in to that app to access the data. It would be better to be able to access everything within ticktick. Aside from that, ticktick is great. Overall: I've been using ticktick for over a year now and I use it daily. My partner and I use it to ensure we are on the same page with our daily tasks, chores, taking care of the dog, etc. It's been a life changer and has increased my productivity drastically. Hey there! The "Pomo Timer" feature might be helpful? Fantastic! I just love it. Pros: Simply the best task management app out there IMO! The free version offers almost all you need to deal with your OWN tasks. The clean interface and intuitive use is a gem in this complicated world. It does help me manage all my work and personal tasks on a daily basis. I love it and after trying many many other options I just stuck with TickTick for its beautiful falt design and simplicity of use as well as the clarity of all the reminder/tasks/priority. Cons: The free version comes with one attachment possible per day which doesn't make any sense IMO. It's also very difficult to work with a team if you keep the free version. Thus consider switching to the full version if you have to work with your work team. Overall: Clear, simple and perfect task management app. Best solution out there since Wunderlist got its development stopped. Pros: The integration of task management system with Pomodoro timer is the most attractive features for me. The ability of staying sync across all the devices is another amazing thing about TickTick. Cons: The alert system is kinda less thought-out feature I believe. Even if I miss some deadline, it fails in some instances to alert me properly. Overall: My workflow was messy and I missed many tasks before I started using TickTick. The inclusion of Pomodoro timer helped me stayed focus during works. Hey there! Have you tried the 'Annoying Alert' feature? It might help you avoid missing notifications. TickTick is a versatile task manager that looks great and is easy to use. Pros: It is very colorful, with customizable backgrounds and a flexible interface. It allows you to create projects, tags, and powerful smart lists so that you can build a very personalized workflow. The mobile apps are well designed, easy to use, and include widgets to make capturing tasks and ideas very easy. There is some natural language recognition to make it easier to set due dates and tags as you create tasks. It includes a pomodoro timer to help keep you focused and track time, and also a calendar view so that you can see what important deadlines are coming up. Cons: The smart lists are limited compared to more powerful tools like Todoist. More rigidly structured than more flexible tools like Todoist, which can get frustrating at times. Overall: TickTick helps me manage my personal projects, and helps me keep track of what I need to do while running from place to place. 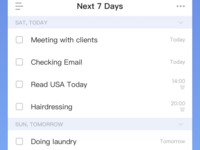 Pros: Ticktick is the simplest app I've used to make a to-do list. What I like about it is that all you need to do is write your To-Do List and voila, it's saved. You can then edit the activity if you want to add an alert. Ticking off the to-do list in TickTick is also easy. Plus, I also like the multiple themes you can use for free. I like the Dark Theme the most because it looks very professional. Cons: You cannot add photos yet to your to do list. It would be nice if you can take pictures of receipts, documents, which you want to also link to your To-Do List. You can add attachment to the todo task. Pros: It gets straight to point of creating to-do lists. It's not cumbersome at all. I've used my many to do list apps and this one just gets it. The free version provides enough features to get the job done. It syncs well with my iPhone and Mac. I love the menu bar dropdown on the mac. Cons: I don't think there is a way to share lists with other users and sync updates. I never had the need to do so before but just in case for the future I would like more sharing options. Overall: This app deserves more praise. Simple, easy, straight to the point to-do list. Pros: Very easy to use, free version has a lot of features, nice web interface. Overall: I've been using TickTick for 5+ years on and off. Hey there! Have you encountered any syncing issue? Please contact us at support@ticktick.com, so that we could look into it for you. Pros: TickTick works really well for short-span small-scale projects with medium turnaround. Due dates and tags work really good. Timer is also very comfortable to use. Cons: TickTick might seem limited in comparison with the bigger task management tools. If the team is bigger than a two-three members - things get really clumsy. Overall: TickTick is everything you want for a task management tool. It is easy to use, the design is intuitive, stuff never gets cluttered and it never lets your focus slip to something unrelated to work. Hello! Feel free to contact us via support@ticktick.com if you have any feedback to give. We are always happy to learn and improve. Pros: I always have so many things to do each day. I enjoy putting my list of activities or stuff I have to remember on this site. It's a to-do list site and I love it. My favorite part of this site is how I can add the importance of the reminder list I have. Each list I create has a different level of importance. I can click the button for High, Medium or Low. This always gets my attention when I am working on something that is very important. I don't want to go back and do it again, so I put it on high. When I see it on high I automatically remember to do it first or as soon as I can. I also like how I can put my most recent reminders on the due in next 7 days area. I need to see this list in front of me, so the printing option is awesome. Cons: I dislike the tag option. I mean some people may want to add tags to what they are writing,but to me it's not needed. The inbox area could also have the share option for the free users. The premium is nice, but we all need the option to share what we wrote. They may need to work on this and expand it more. Overall: I needed a site that would help me organize the daily stuff I have to do each day. This helped me do just that. I love how it has notifications which help me keep track. Overall, it keeps me going and helps me stay focused. Pros: I like the simplicity look of this application, the functionalities of what a to-do list should have is there. The fees of the software is also acceptable based on what they offered. Overall very satisfy with it. Cons: Nothing much I can complaint about, but if I can complaint one thing, I not really sure how to add one task under subtasks or it is non-existence. Overall: Overall enjoyable experience, the price that they charge is consider acceptable and it has a good looking interface.